I have never dealt with a remote breeder before so I was uncertain about having a bird flown across the country. I was not only worried about the parrot's safety but also comfort during the long passage. I would like to share some of my thoughts about the concept in general and my personal experience. First off, the good news is that the United States can be traversed by air north to south in 3 hours, east to west in 6. So if a direct non stop flight can be achieved, it should be possible in 6 hours or less. We must add at least a 1 hour drive to the airport and one hour from upon pickup. Next we can add at least 1 hour for pre-departure processing and 1 hour for post-arrival processing. So without any delays, realistically the bird can be expected to spend between 7-10 hours. However, flights that require transfers can easily add another 2-4 hours to this estimate. 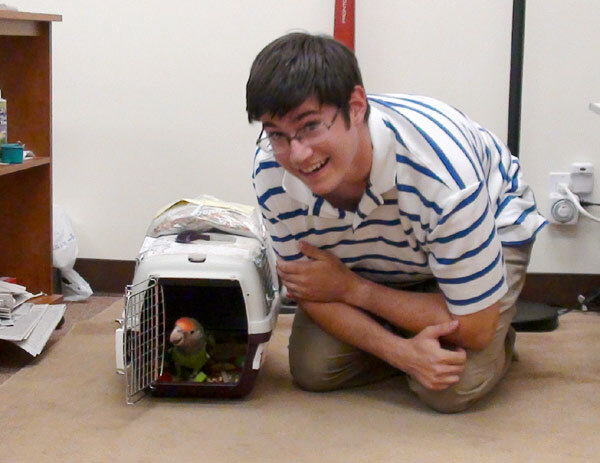 What I am trying to demonstrate is that a good chunk of the time the parrot needs to spend in the carrier, it isn't even in an airplane at all. Therefore, whether you are shipping across the country or a few states away, the flight time plays less of a roll. I would recommend driving to pick up a parrot when possible but only as long as the total drive time is equal to or less than the total time required for air shipping as outlined above. You see, whether the parrot is being flown or driven, when it is bouncing around in a carrier all day, it won't eat or go about its business anyway. So you may as well search for the quickest solution possible. A 24 hour drive is definitely more stressful than a 3 hour flight (totaling about 8 hours of carrier time). Of course driving affords an element of security because you know where your bird is and can monitor its well being. When it is handed over to the airlines you can only guess at what kind of care they take. But this is where I'd like to bring my personal experience forward. I wasn't sure what to expect when I received the carrier with Truman. I half expected to see a dead parrot nailed to the perch just inside. I was absolutely shocked to find him peering out by the door and looking excited! After being cooped up for 8 hours, I'm sure I'd be more cranky myself. I must say, it was a pleasant surprise to find how smooth everything went. The plane arrived on time (actually a few minutes early), the bird was out and handed to me within an hour of the airplane's arrival. 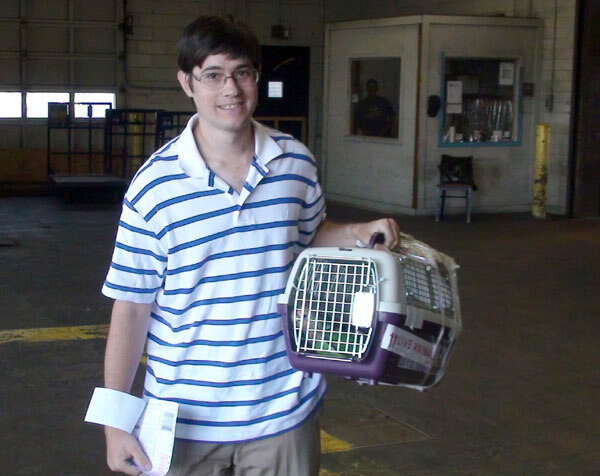 The carrier wasn't tampered with and the bird was in good health and spirit. All and all I find that the air trip had little impact on the parrot. -Make sure they send it out on an early flight. Not only does that give more opportunities in the case of a missed flight, earlier flights also tend to be on time. -Have them put your name, phone number, and address on the carrier itself and the identifier for your airport. -Wire tie all the doors shut and anywhere the carrier snaps together should also be zip tied. -Always try to go direct non-stop flight because that reduces the variable of missed connection and the extra time it takes. 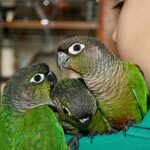 -Get to the airport early to pick up your bird because the cargo terminal or baggage area where you are to pick up your parrot may be difficult to find. Airports tend to have ring roads so if you miss the turn off, you may have to go all the way around the airport again until you have another chance. I went around LaGuardia 6 times I think before I finally found the proper cargo area. -Make sure you bring ID to the airport and even alternate ID just in case. Let me add that the shipping was just $114 and payable collect on receiving the bird. This added to my decision of getting the bird shipped to me. Driving or flying down there would have cost significantly more. And if I flew down by airline to pick up the bird, they would have made me check it in as baggage anyway! It's great that your experience went well, but I've heard from a breeder that one of her bird carriers got flipped upside down. She puts a cup of seed in with the birds, along with some fruits, but when it arrived at the destination the entire cup was empty. I'm just really not comfortable with letting animals be handled by people that don't care. Because the majority of cargo loaders don't. It's just a job that they hate that they have to do. I'll relate it again to the petstore, but just because you have a job where you come into contact with animals, doesn't mean you have to have respect or compassion for them. Just make sure they don't die in the process of getting them from point A to point B. In the rat world, meaning rat owners who are rescues, breeders and part of fancy rat associations, shipping is a huge no-no. Many breeders make it a positive point that they refuse to ship, because they find it unnecessary. Granted, rats are more readily available than a cape parrot. Actually Jean didn't put a food cup in the carrier. 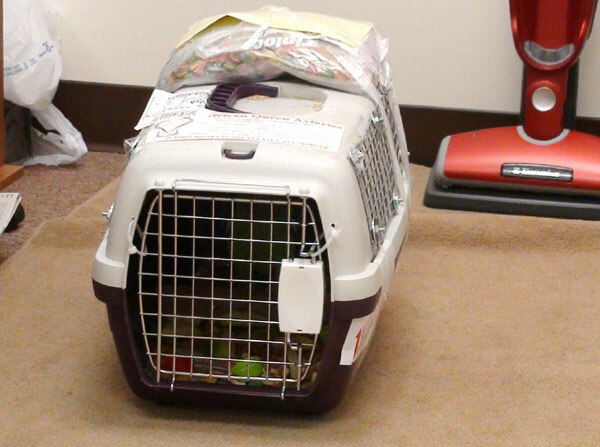 Even if the parrot didn't take a single bite for the 8 hours it spend in the carrier, it really wouldn't matter. He probably didn't eat during the whole deal despite food being available. Jean lined the entire cage bottom with pellets and fruits. This is more like emergency backup food if the flights are delayed rather than a snack to go. Also it serves as litter and holds down some of the poop. Once again, not a good long term travel arrangement but in the short term it's great. I meant more that the carrier was flipped completely upside down, or at least 90 degrees on its side, the only way the cup could have been completely empty. I'd really not like my parrot to be flipped upside down during handling. Also, no one's mentioned the air pressure changing, and how that affects the birds. I'd imagine they're even more sensitive to it than humans, who can get headaches from altitude changes. I think there are pros and cons to both, as with every single argument, ever. lol. [quote="notscaredtodance":1gezu6eb]Also, no one's mentioned the air pressure changing, and how that affects the birds. I'd imagine they're even more sensitive to it than humans, who can get headaches from altitude changes. [/quote:1gezu6eb] Are you kidding me? They're birds! They fly through pressure changes all the time. [url=http://www.youtube.com/watch?v=NU-qqNAEQPI:1gezu6eb]I've taken Kili flying lots of times[/url:1gezu6eb] and it doesn't bother her one bit. The cargo area of an aircraft is pressurized, so it shouldn't be an issue. The only problem I can see is the fact that the cargo area isn't heated but even then it's not going to be as cold as it is outside. Even in a "pressurized" cabin, the pressure is reduced to a density altitude of approximately 5,000-7,000ft. This is why despite pressurization you feel your ears pop on landing. However, there's a big difference between this kind of air pressure and the altitude at which it is flying so of course this doesn't bother the humans or bird very much. If anything, the lower pressure makes the bird hypoxic and just makes it sleepy. As for heating. I'm not certain about the specifics of the cargo area but assuming it gets its pressurization and air from the same source as the cabin, the air is actually cooled down rather than heated. The way a modern jet airliner pressurizes the cabin is by using bleed air off the jet engines. The air is already highly pressurized but very hot so in fact it must be run through strong air conditioners to be cooled down to normal temperature before it can enter the cabin. Considering the cargo hold is pressurized means that it is probably receiving the same temperature air as the cabin itself.